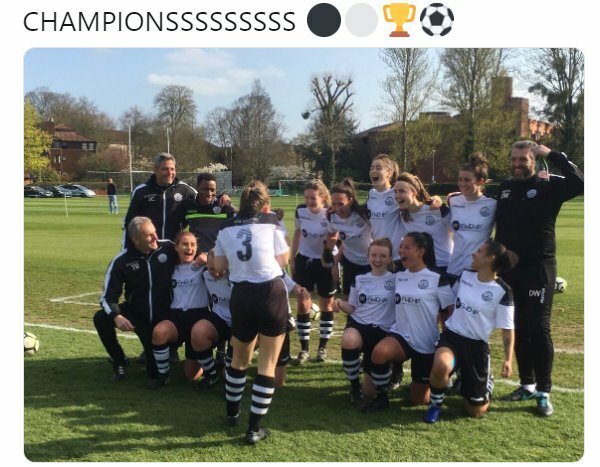 Cambridge City Ladies have won the ERWFL Premier Division with 3 games to spare, a 4-0 home win over Peterborough Northern Star Ladies last Sunday. This Sunday they travelled to Hertfordshire to play Royston Town Ladies looking to end the season unbeaten, just the two points dropped so far. Those coming in the reverse league fixture with Royston who are enjoying a god season themselves in the league 2nd with a 4 point gap over 3rd placed Acle United Women going into the game. A rainy afternoon Royston started well but it was Cambridge who took the early lead Shannon Shaw heading the ball in from six yards after the delivery from a corner wasn’t cleared. Further chances for Cambridge to extend the lead 1st half as they worked hard to limit opportunities up the other end. A 1-0 lead at half time. More urgency from Royston 2nd half as they looked to get back on level terms, hitting them on the break Shaw was put through in the left channel to shoot from the top of the area her shot squeezing in inside the post on the hour, a well taken goal from the edge of the area from 16-year-old Freya Standing seeing Cambridge extend their lead. A frustrating afternoon for Royston their advantage in 2nd cut to a point but remain in a strong position with 3 matches left to play. Acle United Women have been amongst the title challenges for the past 3 season’s, pushing all the way in earlier campaigns haven’t managed to exert pressure on the leaders this season, not that anyone else has. Nevertheless in the top 4 all season are looking for a strong finish into 3rd clinched the 3 points at home on Sunday to close the gap to a point on 2nd placed Royston. Harlow Town Ladies making the long trip up to Norfolk this weekend. The visitors playing 2 thirds of the game with 10 players after Rubie Smith got her marching orders in the 32nd minutes for a rash challenge that saw Acle captain Anna Larkins forced off through injury. Both sides creating openings early on. The game goalless at half-time. Harlow battling hard in the 2nd period to keep Acle at bay as they pushed forwards looking a goal, the winner coming with 6 minutes left of normal play Mary-Anne Hoy stretching out a toe to get on the end of a cross and sent it into the back of the net for her 1st goal for the club. A 4-1 win at home to Wymondham Town Ladies over Bedford Ladies a month ago, the Norfolk side travelled to Bedfordshire this Sunday to play the reverse fixture. 4th in the Premier Division table, Wymondham opened the scoring on 22 minutes after making a good start Laura Nicholls on hand to score the ball flicked on by Chardonnay Johnston. Jorja Patterson doubling the lead just 6 minutes later to see the visitors 2-0 up at half-time. Bedford starting the 2nd half well forcing a save from Wymondham keeper Ashleigh O’Callaghan in the 50th minute, Bedford get it back to 2-1 moments later scoring from a corner. The equaliser coming midway through the 2nd half. The points shared, Eden Kibron and Michelle Byrne Bedford’s goalscorers. 3 wins in a row now for Colney Heath Ladies finding a bit of form towards the end of the season, an away win over Haringey Borough Women this Sunday. The Hertfordshire sides taking the lead in the 1st half a cross put in from the byline parried by the keeper falling to Melissa Godino to smash the ball into the back of the net to score her 1st goal for the club the goal proving to be enough to win the game. St Ives Town Ladies remain 6 points clear and unbeaten still at the top of ERWFL Division One well on course for back to back promotions were up against the side where their excellent season began with a trip to fellow promoted side Lawford Ladies. A close contest Lawford finding their feet in the league well after a heavy loss to St Ives on the opening day. Chances for both side it was St Ives who open the scoring Georgia Stancombe heading in at the far post from an Emily Stephenson cross. Lawford coming back to level inside 10 minutes Daisy Canny captaining Lawford with a good run and pass to tee up Michelle McRae to score her 1st goal for the club. Level at half-time St Ives starting the 2nd half well Lawford battling to keep them out, the scores level heading deep into injury time the visitors pressing Tierney Coulson finding Emily Smith inside the box she took her chance to score and win the game for St Ives. 2nd placed Bowers & Pitsea Ladies can only win their games now and home St Ives slip up keep the gap to 6 points with the two sides due to play at St Ives in a fortnight. This Sunday they were taking on 3rd placed Newmarket Town Ladies at home. 3 draws in a row seeing Newmarket slip away from the title picture themselves, a good season so far playing at this level for the 1st time. Bowers & Pitsea losing just the two matches in the league this season strong themselves buoyed by recent success in the Essex Women’s Trophy Final. Sophie Dowman on target for her 13th goal of the season opening the scoring for Bowers & Pitsea in the 12th minute. That the only goal of the first half. The hosts scoring early in the 2nd half Dowman with the assist putting Georgia Fraser in to slide a shot under the keeper to make it 2-0 her 17th of the season. Jennifer Lyttle with a 25 yard strike in the 86th minute seeing Bowers & Pitsea to a 3-0 win. A trip to Hertfordshire for King’s Lynn Town Ladies this Sunday as they took on 4th placed Stevenage Ladies Reserves. King’s Lynn looking t get some form under their belts in the lead up to the Norfolk Women’s County Cup Final being played at Carrow Road. Came home with all 3 points putting in a good team performance, winning the game 2-1, Olivia Baker scoring both the goals enough to win the game with Emily Schofield scoring for Stevenage. Hoddesdon Town Owls Ladies are up to 5th place in the ERWFL Division One table continuing their recent run of good results that has seen them win 4 on the bounce now. Were away to bottom side Bishops Stortford Ladies this Sunday. Rosy Wodhams scoring a hat-trick moving her ahead in the goal scoring charts with 15 now for the season. Both Grace Leslie and Rebecca Scola also getting a goal each too in the 2nd half for the visitors Hoddesdon winning the game 5-2, and they are also credited with scoring both goals for the hosts. Histon Ladies bounced back from last weeks home defeat to Stevenage Ladies Reserves to pick up the points on the road this Sunday against Hertford Town Ladies. A single goal enough to win the 3 points coming late on with just 3 minutes left on the clock. Kirsty Geal making her first appearance for Histon scoring the decisive goal. The win putting Histon to within a point of the top half of the table. This entry was posted in ERWFL Division One, ERWFL Premier Division, The Round-Up and tagged ERWFL Division One, ERWFL Premier Division, The Round-Up on April 9, 2019 by WFEast. Cambridge City Ladies are the Champions! Has a familiar ring to it as they celebrate their 3rd league title and promotion in 4 seasons clinching the ERWFL Premier Division title this Sunday with 3 games left to spare. There rapid rise through the women’s football pyramid seeing their brief 3 year spell in the regional league to soon come to an end, could yet be the double into the last 4 of the League Cup. Unbeaten in the league this season with just 2 points dropped from 18 played, building strongly on a runners-up finish last season, just 2 points needed this Sunday at home to 5th placed Peterborough Northern Star Ladies who on paper with games in hand could yet catch them. The visitors struggling with numbers of late injuries and suspensions taking a toll travelled with a bare 11. Cambridge in confident mood goalscorers throughout their side won the game by 4 goals to nil to finish the job, Erin Davies, Bella Simmons and Anna Goggin amongst the goalscorers. Have had a fantastic season, congratulations for all the players, coaches and supporters on the title, promotion and look forwards to seeing you in the FAWNL. Royston Town Ladies are also enjoying a strong season in the ERWFL Premier Division, up to 2nd in the table lay 4 points clear of 3rd placed Acle United Women with both having 4 games left to play. Were away from home this Sunday taking on AFC Dunstable Ladies. The host struggling to get a side with just the 8 available, a fighting spirit amongst them and aren’t prepared to roll over, new additions coming the squad and outlook positive for the future. Royston running out 5-0 winners in the finish taking the lead trough Samantha Edgar. Rebekah Fisk doubling the lead, the other goals scored by a pair of ex-Dunstable players, Charlotte South with two strikes from distance getting a brace with Danielle Carty adding the visitors 5th goal. A successful trip down to Essex for Acle United Women on Sunday the Norfolk side making the long trip down south to play Brentwood Town Ladies. Acle starting well taking the lead on 9 minutes with Lauren Bullard the goalscorer. Pressing the attack Rhianne Brister doubling the lead scoring at the far post just past the half hour mark. 2-0 up at the break, Acle got the 2nd half off to the perfect start extending their lead, Bullard’s back heel finding Kirstie Kindred to make it 3-0 at the near post. Brentwood pulling it back to 3-1 through Kirsty Knight on the hour. Acle restoring their 3 goal cushion with 80 minutes left to play with captain Anna Larkins sending a shot past the keeper. A 4-1 win for Acle taking them back up to 3rd in the Premier Division table. A high scoring match also in the ERWFL Premier Division between Haringey Borough Women & Bedford Ladies this Sunday. Hosts Haringey scoring 3 goals it wasn’t enough to get anything from the game however as visitors Bedford hit them for 7 up the other end to win the 3 points and put the pressure back on the sides in the top half of the table. League leaders, St Ives Town Ladies not in action this Sunday in ERWFL Division One it was an opportunity for 2nd placed Bowers & Pitsea Ladies to look to close the 9 point gap. Fresh from winning the Essex Women’s Trophy last Sunday, the Essex side had a long trip up to Norfolk this Sunday to play King’s Lynn Town Ladies. A brace from Georgia Fraser seeing Bowers & Pitsea leading the game 2-0 at half time. Fraser going on to complete her hat-trick on the hour to move ahead a top scorer with 16 goals for the season. Eloise Ives also getting her name on the scoresheet with Bowers & Pitsea’s 4th goal in the final 15 minutes. King’s Lynn reduced to 10 with Charlotte Griffith shown 2 yellows. For the 2nd game in a row Chloe Slater scored direct for a corner kick for Newmarket Town Ladies, the goal earning the side 3rd in Division One a point on the road taking on Hertford Town Ladies on Sunday. The game all square at 1-1. Stevenage Ladies Reserves move back up to 4th in the ERWFL Division One table winning away from home on Sunday against Histon Ladies. The visitors taking an early lead at The Glassworld Stadium 1-0 up in the 7th minute. Histon fighting back to level the scores in the 33rd minute a superb individual goal from Georgia Day picking up the ball outside the box keeping possession well before turning her marker and getting away a shot into the top corner. 1-1 at half-time Stevenage getting back into the lead midway through the 2nd half. A 3rd goal added deep into stoppage time to ensure the 3 points, Faith Greene, Emily Schofield and Naomi Sleator with the goals. Hatfield Peveral Ladies were hosting Lawford Ladies this Sunday, meeting again after a 1-1 draw in the reverse fixture a month ago. Lawford with games in hand looking to build on a spirited performance in last Sunday’s Essex Women’s Trophy final. A couple of new faces in their squad Lawford came home with the 3 points clinching a narrow 2-1 victory, captain Daisy Canny with her 16th goal of the season with Susan Jackson also celebrating a goal. Megan Warner wit the goal for Hatfield Peverel. 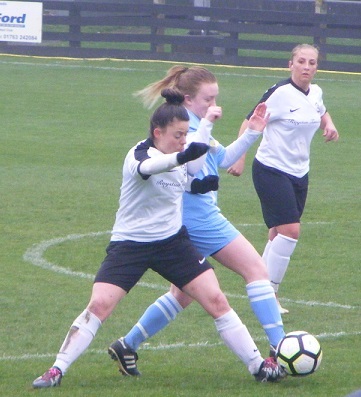 This entry was posted in ERWFL Division One, ERWFL Premier Division, The Round-Up and tagged ERWFL Division One, ERWFL Premier Division, The Round-Up on April 2, 2019 by WFEast. It’s that time of the season again when the calculator has to be brought out to workout all the different league winning scenarios. Cambridge City Ladies are almost there, just 2 points needed now to ensure them the Premier Division title with 4 games left to play. All but assured now just 3 season’s in the ERWFL a successful spell, the Division one title in their debut season, runners-up last season in the Premier Division along with a League Cup Final appearance in that spell. An unbeaten season to date with just 2 points dropped in 17 games played so far, 16 wins their lead at the top 14 points. Cambridge City were away to Wymondham Town Ladies this weekend, enjoying a fantastic debut season in the Premier Division themselves up to 2nd spot in the table. A tight first half Cambridge getting in behind the Wymondham defence in the 32nd minute going in front through an own goal. A blow for Wymondham in the 2nd half losing goalkeeper Ashleigh O’Callaghan through injury, Jorja Patterson donning the gloves, Cambridge pressed the attack, have a potent attack with a few contenders for top scorer, Shannon Shaw amongst them finding the back of the net for a hat-trick moves onto 19 for the season, full back Lauren Tomlinson also scoring in a 5-0 victory. The leaders at home next Sunday to one of the two sides that can still catch them Peterborough Northern Star Ladies. Peterborough Northern Star Ladies were at home this Sunday the 5th placed side with games in hand taking on 3rd placed Royston Town Ladies, the only two sides remaining that can catch Cambridge City at the top. Hayley Eldred scoring the only goal of the game glancing the ball on form a corner to score her 12th game of the season. 3 sent off late in game one from Royston and both Larissa Frederick and Katie Steward for Peterborough Northern Star. The 3 points lifting Royston back up int 2nd spot in the Premier Division table. 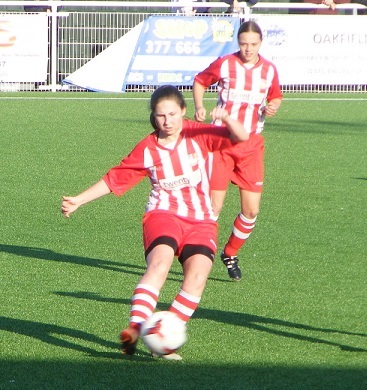 Harlow Town Ladies in 6th spot travelled to Creasey Park this Sunday to play AFC Dunstable Ladies. The hosts struggling 2nd bottom for numbers and injuries throughout the season have been recruiting building their squad back up recently. Both sides starting well the score 1-1 inside the opening 10 minutes, Vicky Allen with the goal for Dunstable. All square at half-time Harlow began the 2nd half better taking an early lead 2-1, Dunstable with a couple of chances to equalise Harlow extended their lead to 3-1 with an hour gone. Dunstable pulling it back to 3-2 in the 64th minute Alex Chilwell making it 2 goals from 2 appearance getting a shot away from a free-kick swung into the box. Dunstable coming back to make it 3-3 from another free-kick played into the box Allen’s shot turned in off a defender. Both sides pushing for the winning goal late on taking a point each from the match. Bethany Chambers, Lucy Edmeades and Tayla Handscombe with the goals for Harlow Town Ladies. Colney Heath Ladies were at home on Sunday taking on Bedford Ladies, Bedfordshire Women’s County Cup winners for the 2nd successive season last Sunday. It was Colney Heath who had the better of the first half the Hertfordshire side taking the lead from a corner, Lucy Hancock putting the ball in for Kelly Hancock to score with a bullet header at the far post. A brace for Hancock to put Colney Heath 2-0 up the ball pinging around the Bedford area falling to Hancock striking it into the top corner on the half-volley. Bedford fighting back to level the scores after in the 2nd half with Setor Acolatse and Maya Sidhu capitalising on defensive errors to make t 2-2. Colney Heath pressed the attack Rianne Townsend-Brown hitting the post before Christina Freestone smashed a shot in under the crossbar to score what would prove to be the winning goal for the hosts Colney Heath winning 3-2. 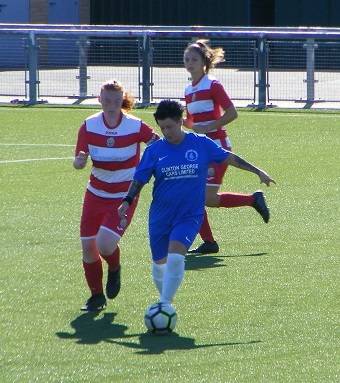 A run of six defeats in league and cup coming to an end this Sunday for Brentwood Town Ladies as they won at home taking on AFC Sudbury Ladies enduring a tough time themselves this season short on players at the foot of the Premier Division. A brace for Georgia Holdaway at the weekend takes her onto 23 goals for the season. There was a brace too for Marie Barker along with a 1st Brentwood goal for Hope Strauss in a 5-1 win. Ceri Harris on the scoresheet for Sudbury. St Ives Town Ladies extend their lead at the top of ERWFL Division One to 9 points. Were on the road this Sunday with a trip to down to Hertfordshire to play Stevenage Ladies Reserves. A close contest between the sides a single goal the margin with Emily Smith getting it for St Ives Town in the 2nd half to see their unbeaten season following promotion to the ERWFL extend to 17 matches. 5 left to play a healthy lead with home matches with 2nd placed Bowers & Pitsea Ladies who have a game in hand and 3rd placed Newmarket Town Ladies to come. With Bowers & Pitsea Ladies playing in the Essex Women’s Trophy this weekend it was a chance for Newmarket Town Ladies promoted with St Ives Town last season to move above them into 2nd, a win at home to King’s Lynn Town Ladies would have seen them go above the Essex side on goal difference. An excellent first half for Newmarket taking the lead inside 3 minutes with Chloe Slater scoring her 1st goal of the season putting the ball in direct from a corner. 5 minutes later Newmarket doubled their lead Antonia Smith sending the ball in after it wasn’t cleared from a free-kick. King’s Lynn pulling a goal back in the 15th minute. Newmarket restoring their 2 goal lead with 10 minutes left to play in the first half Jodie Woodfield with the goal to make it 3-1. King’s Lynn with a much improved performance in the 2nd half battling back to see the sides share the points scoring just past the hour before levelling the scores in the final 15 minutes, an own goal along with her 21st & 22nd goals of the season for Tiffany Forshaw. 4th placed Hutton Ladies were away to Cambridgeshire side Histon Ladies this Sunday, the Essex side taking an early lead at the Glassworld Stadium 1-0 up after 6 minutes. Histon getting back on level terms in the 34th minute a free-kick played into the box from the right, Tess Shaw connecting to turn it into the back of the net to make it 1-1. Hutton responding straight away to retake the lead just a minute later. Histon pressing late in the first half equalising for the 2nd time with Sophie Lanham’s shot squeezing in at the near post. 2-2 at the break Sally Appleton and Vicky Kinsman with he 42nd of the season scoring for Hutton. 2-2 the scores heading into the final 10 minutes of the game the winning goal coming in the 83rd minute, Lanham with the ball inside the box sending it back across the keeper to see Histon win 3-2. A good run from Histon now pushing for the top half of the table a five games unbeaten with 3 straight wins. A 3rd successive league win too in Division One for Hoddesdon Town Owls Ladies the 6th placed side at home to Hatfield Peverel Ladies this weekend. Hoddesdon running out 4-2 winners after the final whistle, Rosy Wodhams scoring a goal in each half to take her onto 12 goals for the season for Hoddesdon, Leah Dunnage on target with her 2nd goal in 3 matches too along with Natasha Crick moving into double figures for the season with a goal in the 83rd minute. Jasmine Cox with both the goals for Hatfield Peverel. Has been a torrid season so far for Bishops Stortford Ladies struggling to get a team out for several fixtures have nevertheless battled hard and stuck together. Bottom of the table were at home to a resurgent Hertford Town Ladies who have been trough a tough period themselves. Just the 9 available when Bishops Stortford were beaten in windy conditions away to Hertford at the end of January 4-1 then, Bishops Stortford were celebrating at the final whistle this time around as they beat their opponents 3-1 to win for the 2nd time this season. 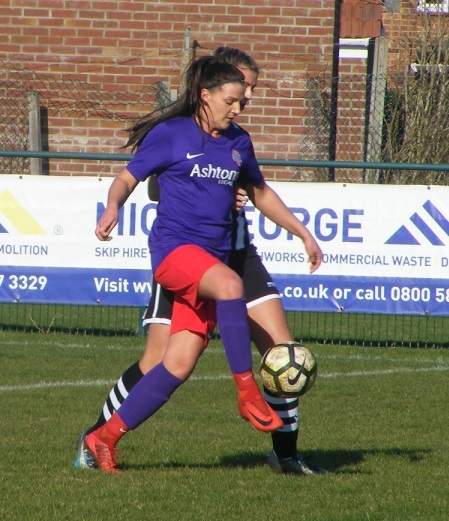 This entry was posted in ERWFL Division One, Essex Women's Premier Division, The Round-Up and tagged ERWFL Division One, ERWFL Premier Division, The Round-Up on March 26, 2019 by WFEast. A 13 point lead now for Cambridge City Ladies at the top of the ERWFL Premier Division. 17 unbeaten now in the league as they recorded a 16th win of the season against Brentwood Town Ladies on Sunday. A brace from striker Shannon Shaw taking her to 16 for the season along with a goal from Carla Penny also her 16th of the season securing a 3-1 win for Cambridge City in Essex. A quick turnaround as they return to action on Tuesday evening at The Abbey Stadium looking to defend the Cambridgeshire Women’s Invitation Cup against rivals Cambridge United WFC, both sides showing great form going into the match. A blow for 2nd placed Royston Town Ladies on Sunday as they lost for the third time this season away to Harlow Ladies. The Essex side picking up a great win at home as they look to consolidate a top half first in their debut season in the ERWFL Premier Division. Olivia Steele scoring for Harlow her 10th of the season, also on target with a goal in a 2-0 win for Harlow was Bethany Chambers fast closing in on double figure herself with 9 goals now from just 5 appearances. Other results going their way see Norfolk side Wymondham Town Ladies climb up into 2nd spot in the ERWFL Premier Division, themselves enjoying a fantastic first season playing at this level. A point earned in the reverse fixture recently Wymondham Town Ladies were hosting Peterborough Northern Star Ladies this Sunday. Wymondham getting into an early lead with Hannah Waters scoring inside 15 minutes to put them 1-0 up. Goalkeeper Ashleigh O’Callaghan with a couple of vital saves to keep Peterborough from levelling. Waters with the assist setting up Mollie O’Callaghan to double Wymondham’s lead in the 34th minute. Leah Newcombe with a goal line clearance as Peterborough looked to get back into the game, top scorer Laura Nicholls putting the result beyond doubt scoring a 3rd goal for Wymondham in the 90th minute. One other game played in the ERWFL Premier Division on Sunday saw Hertfordshire side Colney Heath Ladies travelling up to Norfolk to play Acle United Women. A close fought game the deadlock broken in the 85th minute with Broghan Scully finding the back of the net from a free-kick for Acle. The game though abandoned in the 94th minute due on medical advice after Acle’s Kate Pasque suffered a neck injury in a collision, unable to be moved an ambulance called for has since been released suffering from whiplash, wish her well. Whether the result will stand or a replay is called I will confirm as I have the news. With the top two not in league action on Sunday in ERWFL Division One it was a chance for the chasing pack to close the gap. Third placed Newmarket Town Ladies travelling to play Hatfield Peverel Ladies, the Essex side improving in recent games adding to their squad Newmarket struggling to get going needed a late equaliser to take a point from the game, Jasmine Cox scoring a brace has 5 now in 5 appearances for Hatfield Peverel. Brooke Wickens with her 12th of the season for Newmarket the visitors awarded a penalty late on Annabel Cuthbert scoring it to make it 2-2 with her 10th since joining the club. Hutton Ladies in 4th were hosting Hertfordshire side Hoddesdon Town Owls Ladies on Sunday. Hoddesdon with a good first half getting into a 3-1 lead thanks to goals from Rebecca Scola, Kristina O’Connell an Rosy Wodhams late in the half. Hayley Piggott scoring for Hutton. The Essex side scoring another in the 2nd period, Wodhams getting her 2nd on 58 minutes and a goal in the 85th minute from Chloe Makepeace securing a 5-2 win for Hoddesdon. 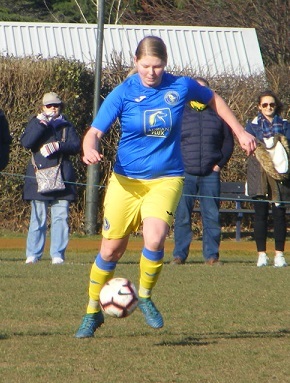 King’s Lynn Town Ladies travelled down to Wodson Park on Sunday to take on Hertford Town Ladies who have been in great form recently with 2 wins and 3 draws from their last six games including 3 draws against the top two. The visitors from Norfolk going home with all 3 points in a narrow win, Hertford scoring 2 goals, Tiffany Forshaw struck twice for King’s Lynn to take the striker onto 20 for the season plus and own goal to win the game 3-2. Histon Ladies were hosting Bishops Stortford Ladies in Division one this Sunday, the Cambridgeshire side winning the game 2-0 to claim the 3 points with Alison Wright scoring her 11th goal of the season from the penalty spot. Lucy Julian also finding the back of the net with her first goal for Histon. The game between Stevenage Ladies Reserves and Lawford Ladies abandoned due to a nasty injury to a Lawford player, wishing the player concerned all the best for a speedy recovery. This entry was posted in ERWFL Division One, ERWFL Premier Division, The Round-Up and tagged ERWFL Division One, ERWFL Premier Division, The Round-Up on March 19, 2019 by WFEast. Cambridge City Ladies extended their unbeaten run at the top of the ERWFL Premier Division to 16 games this Sunday to move 11 points clear. Were away at the weekend taking on Colney Heath Ladies for the 2nd successive week, a 2-0 victory at home in the League Cup quarter finals last time out. The weather conditions playing havoc as they would for everyone this weekend, Cambridge City on the attack chances created a goal disallowed took the lead in the 1st half went on to score 3 more to win the game 4-0 to clinch the 3 points, a brace for top scorer Erin Davies moves onto 22 for the season. Lauren Tomlinson also getting on the scoresheet along with Freya Standing scoring her first, first team goal in only her 2nd appearance. Royston Town Ladies climb up into 2nd place in the ERWFL Premier Division ahead of Acle United Women, the Hertfordshire side enjoying a good season were at home on Sunday up against AFC Dunstable Ladies who travelled with just the 7 available, through a shortage of players and injuries. Damage limitation a tough ask against a Royston side with goalscorers all over the pitch. Sammy Tinsley top scoring in the match netting a hat-trick. 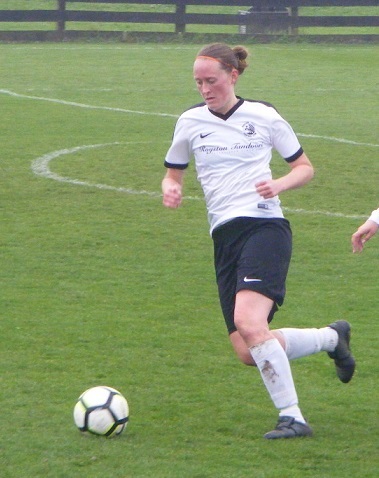 Three players were on target for a brace, Angharad Chambers, Georgia Gannaway and top scorer Joanne Rutherford. Goals to for Samantha Edgar, Eva Ramsey and ex-Dunstable player Charlotte South in a 12-0 win. A tough season for Dunstable yet they remain positive, new signings and players returning from injury are already building for next season. Another side struggling in the ERWFL Premier Division this season are, AFC Sudbury Ladies, bottom of the table they too are short on numbers, a trip down to Essex this Sunday to play Harlow Town Ladies, the promoted side tussling with Bedford Ladies for 6th spot in the table. Bethany Chambers new to the 1st team squad making just her 4th appearance this Sunday took her goals scored to 8 as she was on target for a double hat-trick. Poppy Binding, Harlow’s top scorer moved onto 15 for the season with a brace at the weekend. A brace too for Olivia Steele, with Rubie Smith also finding the back of the net for a goal. The final score 12-1 to Harlow, Tegan Burling also scoring her 1st of the season for Harlow. Wymondham Town Ladies were at home to Bedford Ladies. The Norfolk side newly promoted to the ERWFL Premier Division consolidating 4th position just 2 points behind 2nd placed Royston. Got off to a good start on Sunday opening the scoring in the 9th minute Kayleigh Holloway shooting from outside the box. A minute later Wymondham were 2-0 ahead, Bethany Fretwell scoring from a Mollie O’Callaghan free-kick. Top scorer Laura Nicholls making it 3-0 inside the opening 20 minutes. Bedford reducing the deficit to 3-1 before half-time. Wymondham restored their 3 goal cushion with 15 minutes left to play, Nicholls cross put in at the far post by Holloway for her 2nd of the game. Wymondham winning 4-1. Behind the chasing pack lay Peterborough Northern Star Ladies in 5th another postponement this weekend sees them have up to 5 games on the sides above them, a busy run in to come. ERWFL Division One saw 4 of the scheduled 6 league games this Sunday fall foul of the weather. 2nd placed Bowers & Pitsea Ladies were on the road on Sunday off to Wodson Park to play Hertford Town Ladies. Have been their when it’s windy and know how tough playing condition can be. Hertford enjoying a revival in recent game a 4 game unbeaten run that included a credible 0-0 draw away to Bowers & Pitsea. Now the side met in the reverse fixture with Bowers & Pitsea looking to keep the pressure on leaders St Ives Town Ladies. Hertford taking the lead inside the opening 2 minutes with the ball squirming under the keeper after a slip. Bowers & Pitsea soon back on level terms Megan Harley with a 30 yard strike finding the bottom corner in the 6th minute. The visitors with an opportunity to take the lead with a minute left on the clock 2nd half awarded a penalty the effort saved. The 2nd half remaining goalless the sides sharing the points once again drawing 1-1. Recent results going against Hoddesdon Town Owls Ladies they have slipped down the Division One table, laying 9th going into Sunday’s home clash with Lawford Ladies a positive result would see them back into the top half of the table. The weather conditions not helping Hoddesdon starting slow the sides were level at 1-1 at half-time, Daisy Canny on target for Lawford, Rosy Wodhams scoring late in the half for Hoddesdon. The hosts getting the better of the 2nd half Kristina O’Connell putting them into the lead in the 51st minute, Hoddesdon were quickly 3-1 ahead with Leah Dunnage scoring for the 1st time this season. Grace Leslie securing the 3 points for Hoddesdon with a goal in the final 10 minutes to see the game won 4-1. This entry was posted in ERWFL Division One, ERWFL Premier Division, The Round-Up and tagged ERWFL Division One, ERWFL Premier Division, The Round-Up on March 12, 2019 by WFEast. Cambridge City Ladies strengthen their grip at the top of the ERWFL Premier Division as they open up a 9 point lead at the top of the table with victory at home to 2nd placed Acle United Women on Sunday. The Norfolk making the journey needing to close the six point gap their opponents had opened up if they wanted to keep their own title ambititions alive. The Norfolk side coming up against a side that has dropped just 2 league points to date, Cambridge City have a strong side with goal throughout the attack, Shannon Shaw starting getting a goal Cambridge City’s other goalscorers starting on the bench with Sarah Mosley, Carla Penny & Bella Simmons all adding to their tally’s with a goal a piece in a 4-0 win. 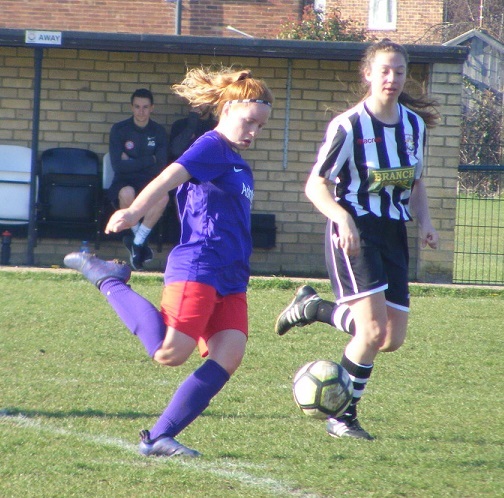 A weekend off for 3rd placed Royston Town Ladies, it was an opportunity for the 4th & 5th placed sides Wymondham Town Ladies & Peterborough Northern Star Ladies to close the gap as they met at the Branch Bros Stadium on Sunday. Women’s Football East was there too to watch the encounter. Wymondham reaching their 3rd successive Norfolk Women’s County Cup Final last weekend travelling to Peterborough. Northern Star Ladies losing just once on the opening day have games in hand on the sides above. Were without a few this Sunday with just the bare 11 available. Hannah Waters with a chance to put Wymondham into the lead first half. Wymondham goalkeeper Ashleigh O’Callaghan twice denying Peterborough. Goalless at half-time Peterborough hit the ground running 2nd half Cassie Steward with two well taken strikes putting the hosts into a 2-0 inside 55 minutes. Soon after a coming together and subsequent fall saw Peterborough attacker Georgia Coulson fall and suffer a nasty wrist injury. A lengthy delay followed as she received on the pitch treatment. A fractured wrist suffered Peterborough with no replacement continuing with 10 almost half an hour later. Took a while for both sides to settle, Peterborough not sitting back on their lead tried to get out attack take the game to Wymondham, their top scorer Laura Nicholls played into a shooting position top of the area by Mollie O’Callaghan fired home to reduce the deficit then with the clock running down Hannah Waters running in behind was pulled down inside the Peterborough box, Nicholls with a powerful penalty levelling the scores with her 2nd of the game. The points shared. Bedford Ladies were at home to Essex side Harlow Town Ladies on Sunday in the ERWFL Premier Division 6th & 7th both sides with 21 points going into the game. A 100% winning record for Bedford in all competitions since December their good form continued this weekend as they won the match 2-0 scoring a goal in each half to move 3 points clear of their opponents. Lauren Murray with her 4th goal in 3 appearances for Bedford and Joanne Makin in her 1st start of the season scoring the goals. At last it’s a win for Haringey Borough Women, 3 points on the board winning at home to fellow strugglers AFC Dunstable Ladies this Sunday. Has been a tough period for the club following a tough season in the FAWNL after losing a good portion of their promotion winning squad the new side has had a difficult baptism have stuck together and can finally celebrate a league win and 3 points, climb off the bottom of the Premier Division table too. AFC Dunstable Ladies travelling with a reduced squad again just the bare 11. Battled well scoring twice in the game with Stephanie Fisher netting her 1st of the season and Alex Chitwell making her debut also scoring. Haringey Borough scoring twice as many up the other end to win the game, Brooke Hills making her 1st start scoring a goal with Seren Ahmet, Aaliyah Boyea & Sandeep Tak all celebrating a goal in a 4-2 win. St Ives Town Ladies open up a 7 point lead at the top of ERWFL Division One the newly promoted side at home to defending champions Stevenage Ladies Reserves this Sunday. St Ives unbeaten since joining the league this season coming out on top in a competitve game with Stevenage, St Ives coming out on top to win their 12th game of the season 3-0 thanks to goals from top scorer Tierney Coulson, Georgia Stancombe and Harriet Ford. Newmarket Town Ladies promoted along with St Ives Town Ladies from the Cambridgeshire Women’s Premiership are also enjoying a great 1st season in the ERWFL up to 3rd in the table were at home on Sunday looking to consolidate their league position, knew they had a tough game ahead with Hertford Town Ladies the visitors unbeaten in their last 4 including draws with St Ives Town & 2nd placed Bowers & Pitsea Ladies. Brooke Wickens charging down the ball opening the scoring in the 25th minute for Newmarket. Hertford pulling the scores level before half-time. Newmarket were awarded a penalty 10 minutes into the 2nd half Laura Bailey firing it home to put the hosts back into the lead. The 3 points secured in the final minute with Sarah O’Rourke put through on goal to see Newmarket win the game 3-1. Fifth placed Hutton Ladies were away this Sunday up against Bishops Stortford Ladies in ERWFL Division One. A lively game against the bottom side that saw plenty of goals scored. Bishops Stortford able to name 3 subs for the game finding the back of the net for 3 goals with captain Broghan McHale netting a hat-trick. 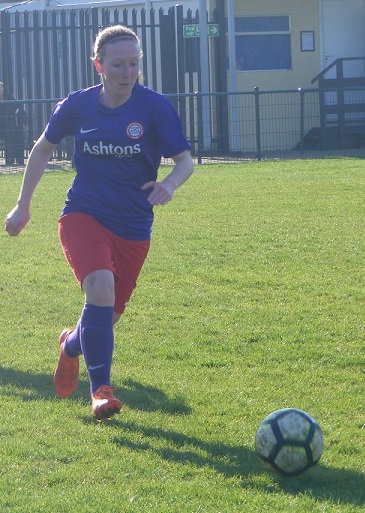 Hutton have Vicky Kinsman leading their line this season and she is closing in on 40 goals for the season already with another brace at the weekend. A brace too for Sally Appleton along with a goal for Kayleigh Franklin seeing Hutton run out 5-3 winners. Elsewhere in Division One the points were shared on Sunday. Fresh from securing a place in the Norfolk Women’s County Cup Final, King’s Lynn Town Ladies travelled to Cambridgeshire at the weekend to play Histon Ladies. Georgia Day scoring for the hosts with Rochelle Woods on target for King’s Lynn with her 9th goal of the season in a 1-1 draw. 1-1 too between Lawford Ladies and Hatfield Peverel Ladies on Sunday in Division One. The hosts playing for 80 minutes with 10 players after Harriet Young was sent off. Ex-Lawford player Jasmine Cox scoring for Hatfield Peverel against her old club. Captain Daisy Canny netting her 14th of the season for Lawford, the points shared. This entry was posted in ERWFL Division One, ERWFL Premier Division, The Round-Up and tagged ERWFL Division One, ERWFL Premier Division, The Round-Up on February 26, 2019 by WFEast. Like the FAWNL a large number of clubs for the ERWFL were involved in the latter stages of their various County Cup competitions at the weekend that saw a reduced fixture list across both the Premier & Division One this Sunday. Two games from the Premier Division, 3rd placed Royston Town Ladies were at home taking on Bedford Ladies, a win would have seen them move above Acle United Women into 2nd spot in the table. As it was Royston were defeated for just the 2nd time this season Bedford in 8th climbing back up into the top half of the table with the 3 points. Lauren Murray netting a brace for the visitors with Carissa Kaczorowski and Maya Sidhu also on target in a 4-2 win. Joanne Rutherford and Hayley Elderd scoring the goals for Royston. AFC Dunstable have at times struggled for players to fulfil fixtures this Sunday they had just the 8 available as they took on Colney Heath Ladies at home. Injury seeing them down to 7, Colney Heath with the player advantage taking the lead from the penalty spot with Lucy Hancock scoring to make it 1-0, Dunstable striking the woodwork battled hard. Colney Heath going on to add 3 more goals ran out 4-0 winners. Sophie Joseph and Rianne Townsend-Brown on the scoresheet along with Olivia Mari marking her first appearance for Colney Heath with a goal. Three matches played in ERWFL Division One on Sunday. 4th placed Stevenage Ladies Reserves finally with a game on after a few postponements were at home taking on Cambridgeshire side Histon Ladies. Midfielder Sherrie Evans putting the hosts into a 12th minutes lead. Stevenage giving a penalty away midway through the 1st half Alison Wrights spot kick in off the post to make it 1-1. The sides drawing at half-time. Evans was on target for her 2nd of the game 10 minutes into the 2nd half. That how the score remained heading into the final minute Wright put through on goal setting her shot up over the advancing keeper to see Histon equalise for the 2nd time in the match and take away a share of the points. Hertford Town Ladies resurgence continues as they extend their unbeaten run to 4 matches in Division One with a home win over Hoddesdon Town Owls Ladies this Sunday. Hertford holding a 2-1 lead at the break going on to score a 3rd goal in the 2nd half to secure their 2nd win of the season. Their goals coming from Rhiann Patmore (pictured), Chloe Ring & Olivia Worsfold. Rosy Wodhams with the 1st half goal for Hoddesdon. Hatfield Peverel Ladies were the winners on Sunday, their 1st since joining the ERWFL this season 3 points all coming from draws prior. The Essex side have struggled for goals this season the lowest scorers in the league by far with just 3 before this Sunday have brought in a few new faces to bolster the squad recently performances improving as a result, the win on the board at last were at home to fellow strugglers Bishops Stortford Ladies. Jasmine Cox adding a goal threat for Hatfield Peverel scoring her 2nd goal in 3 appearances. Victoria King getting on the scoresheet too with her 1st goal of the season in a 2-0 win that takes Hatfield Peverel off the bottom of the table. This entry was posted in ERWFL Division One, ERWFL Premier Division, The Round-Up and tagged ERWFL Division One, ERWFL Premier Division, The Round-Up on February 19, 2019 by WFEast. The ERWFL was again hit by the weather games falling foul of water logged pitches in both the Premier Division & Division One. Two games in the Premier Division although one of those was abandoned due to a head injury. Bedford Ladies were leading 2-1 away to Haringey Borough when striker Julia Carruthers suffered the injury and was admitted to hospital has since thankfully been given the all clear, the time of abandonment differing between clubs it has been listed as A-A on the full-time website will update if that changes. One game going the distance then Wymondham Town Ladies fifth in the table at home to fellow promoted side Harlow Town Ladies. The Norfolk side taking a 10th minute lead with striker Hannah Waters strong on the ball sending the ball into the back of the net to open the scoring. The Essex side responding well getting back level on the half hour then going on to take the lead, Chelsea Clarke lobbing the keeper from distance to level the scores back up late in the first half to see it all square at 2-2. Harlow getting the better of the 2nd half scoring twice more to come to make the long journey home with the 3 points the 4-2 victory seeing them climb into the top half of the table. Poppy Binding scoring twice for Harlow now has 13 for the season with Tayla Handscombe also on target along with a 1st goal for the season for Ellie Wallace. Not all bad for Wymondham either as they actually climb a place up to 4th now awarded the home win against Dunstable Ladies back in December. One outstanding tie left to be played in the ERWFL Cup 3rd Round, Division One side Lawford Ladies making the trip to Hertfordshire to player Premier Division side Colney Heath Ladies. A first half brace for Rianne Townsend-Brown securing a 2-0 advantage for Colney Heath. A 3rd goal securing the win for the Premier Division side in the 2nd half Charlene Moreton scoring to send Colney Heath through the quarter finals of the competition. A switch to 3G saw one game beat the weather in ERWFL Division One on Sunday, King’s Lynn Town Ladies finally back in league action playing host to new league leaders St Ives Town Ladies. Unbeaten in the league and knowing 2nd placed Bowers & Pitsea Ladies game had been called off the visitors from Cambridgeshire had an opportunity to open a 4 point lead up at the top of the table. An own goal giving St Ives an early lead, Kira Markwell making a great save to deny King’s Lynn an equaliser as they grew into the game. St Ives defending well doubled their lead through top scorer Tierney Coulson. 2-0 to St Ives at half-time. A strong start to the 2nd half from King’s Lynn it was St Ives who were to extend their lead on the hour Coulson lobbing the keeper for her 2nd of the game and 21st goal of the season to make it 3-0. Hannah Seymour-Shove extending St Ives lead 5 minutes later. 4-0 the final score harsh on King’s Lynn who although not finding the break through with a goal themselves made St Ives work for the win. This entry was posted in ERWFL Division One, ERWFL League Cup, ERWFL Premier Division, The Round-Up and tagged ERWFL Division One, ERWFL League Cup, ERWFL Premier Division, The Round-Up on February 12, 2019 by WFEast. 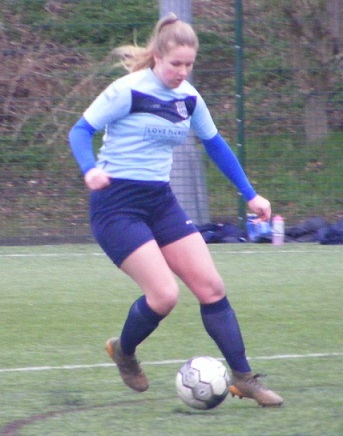 One match taking place in the ERWFL Premier Division this Sunday and it saw league leaders Cambridge City Ladies extend their lead at the top of the table as they won their 13th game of the season at home against Essex side Brentwood Town Ladies. 14 played now with just 2 points dropped in a strong position now with 2 thirds of their games played. Have a potent strike force with goal scorers all over the pitch. Shannon Shaw hitting a brace this weekend to take her to 12 for the season with Bella Simmons also getting her name of the scoresheet with her 14th goal of the season in a 3-0 win. The weather and outstanding cup fixtures affecting the league programme in ERWFL Division One this Sunday, two games featuring the top two in the league and their is a new side leading the way, St Ives Town Ladies going top. Unbeaten since joining the ERWFL this season 14 played with this weekend bringing up their 10th win of the campaign. Were at home hosting Essex side Hutton Ladies. The visitors carrying a potent goal threat themselves Vicky Kinsman adding another goal to her impressive goal scoring record. St Ives, Georgia Stancombe claiming the match ball as she netted a hat-trick up the other end, has 12 to her name now. Tierney Coulson St Ives top scorer adding a goal her 19th of the season as St Ives ran out 4-1 winners. That win for St Ives coupled with dropped points fro previous leaders Bowers & Pitsea Ladies. The Essex side at home to a rejuvenated Hertford Town Ladies coming into the match off their 1st league win of the season last weekend against Bishops Stortford Ladies, have strengthened their squad, a point well earned against unbeaten St Ives a fortnight ago, Hertford followed that up with another creditable 0-0 against the league leaders to take their unbeaten run to 3 matches. This entry was posted in ERWFL Division One, ERWFL Premier Division, The Round-Up and tagged ERWFL Division One, ERWFL Premier Division, The Round-Up on February 5, 2019 by WFEast.